Is joining a giveaway your cup of tea? 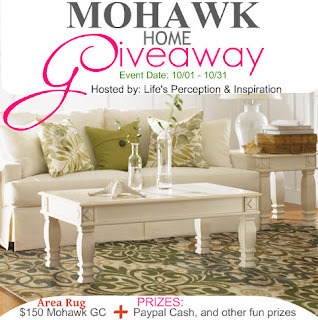 Well then enter now on this giveaway as there are lots of cool prizes to snag aside from the $150 GC from Mohawk. This is going to be exciting and the prizes at stake are really awesome! ENTER NOW! Disclaimer: This blog is not responsible for shipment of prize. congrats in advance to the winner-to-be... :) i hope i will win this. This is a great giveaway and it's open worldwide, so fun! A lot of prizes to win,I wanna join to win those giveaways.The winner is really lucky to have all this. I love their rugs collection hoping to get the prize weeeeeeeeeeh! I hope I'll win the prize. Bless, is it possible to promote this giveaway to my blog? if so, how do I get the codes? i also join this mommy...goodluck sa atin.. I woud love a rug for my entry way! What a great group of prizes!! Thanks for the chance!